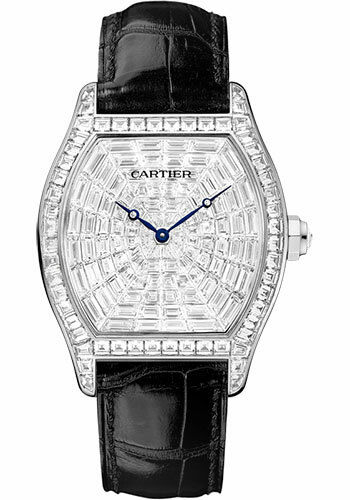 38mm x 48mm 18K white gold case in rhodium finish set with baguette cut diamonds, 7.8mm thick, octagonal crown set with a diamond, mineral crystal, 18K white gold dial set with baguette cut diamonds and blued steel hands, caliber 9601 MC manual movement, black alligator strap, deployant buckle in 18K white gold. Water resistant to 30 meters. 38mm x 48mm 18K white gold case, 14.5mm thick, octagonal crown set with a sapphire, sapphire crystal, silvered dial with Roman numerals and blued steel hands, caliber 9602 MC manual movement with large date at 12 o’clock and small seconds at 6 o'clock, black alligator strap, 18mm double adjustable deployant buckle in 18K white gold. Water resistant to 30 meters.